At Wisconsin Log Homes, we believe that your home should be a perfect reflection of you. It should comfort and inspire you. It should soothe your soul and lift your spirit. It should be a place where you can express your personal style and tastes. And most importantly, it should embrace the warm and relaxing lifestyle you are seeking. A Wisconsin Log Home is so much more than a house – it’s a place where memories are made. A place where you will raise your family. A place where you will enjoy retirement. And for some, it’s a family heirloom and legacy that you are leaving behind. Our team is honored to play a role in bringing your dreams to life; each home has a big piece of our heart. Since hand-scribing our first log home in 1976, Wisconsin Log Homes has evolved to become one of the world’s leading designers, manufacturers and builders of the most elegant and energy efficient log, timber frame and hybrid homes. With our talented team of professional in-house Designers and skilled Craftsmen, we offer you the freedom to create virtually anything you can envision. Explore our custom floor plans or browse our photo gallery for ideas and inspiration. Our Passion is Your Home. Our Focus is You. Finding a custom wood home company you trust with your project can be a big leap of faith for anyone. No matter where you are located, choosing Wisconsin Log Homes means you will be surrounded by people who truly care about you and your home. Our customers tell us that it’s more than the quality of our homes and services that makes Wisconsin Log Homes the best choice. It’s the talented, dedicated and caring people they are surrounded with during their entire project that really creates the ultimate experience. Our team’s openness, honesty, knowledge, ingenuity and our passion to make a difference while nurturing your ideas is what allows us to build outstanding relationships and homes so you can realize your dreams. 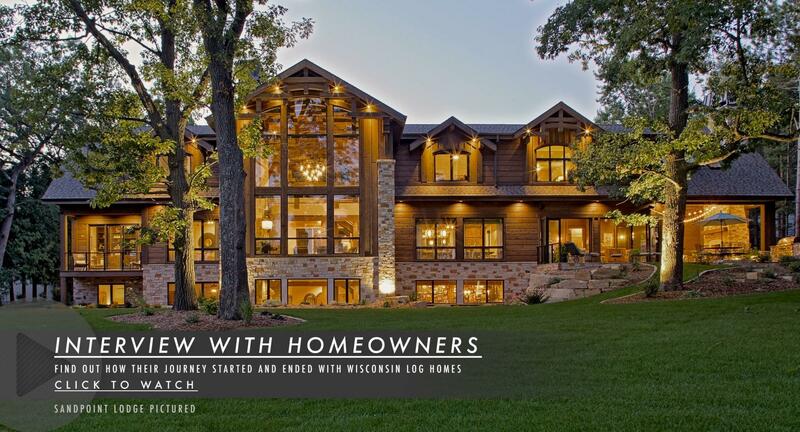 The Wisconsin Log Homes experience offers our clients personal and professional service through every stage of the custom home process – from preliminary site planning, to custom architectural design, to construction services or assistance, to Interior Design & Décor. Our proven Design Build Solution maximizes efficiency and accountability, and simplifies the custom design and construction process for our clients. When you choose Wisconsin Log Homes, you will have access to a level of knowledge and professionalism that is unsurpassed in the industry. No other company can offer you more for the value in terms of service, choices, quality and convenience. Our company’s goal has never been to sell the most homes, it has always been to sell the best homes with the highest level of quality in our custom-tailored products and services. At Wisconsin Log Homes, we don’t follow trends, we start them. Since innovating and introducing our Thermal-Log™ building system in 1979, we’ve been providing leadership in the world’s most energy efficient log, timber and hybrid home construction. Our high performance building system blends the wisdom of modern day construction with the craftsmanship and beauty of log, timber frame and hybrid homes, achieving up to R-40+ walls and R-65+ roof, which translates into energy savings, no log-wall settling or air infiltration, less maintenance and more comfort. Don’t let our name mislead you; most of our clients live many states or even oceans away from our Headquarters in Green Bay, Wisconsin. The distance between our clients and the Wisconsin Log Homes office is as close as the nearest computer or phone. Modern day technology allows us to service clients throughout the world right from our Headquarters with ease.